These simple stuffed cream filled strawberries are easy to make and a crowd favorite, not to mention a great gluten-free dessert. 1. Cut the stems from the strawberries, so the strawberries can sit cut side down. 2. Cut a deep “X” from the tip down being careful not to cut all the way through. 3. Gently open up the strawberry. Set aside. 4. Cream the cream cheese, sugar, and vanilla (and optional lemon zest) until nice and fluffy. 5. Pipe the filling into each strawberry using a pastry bag or a zip top bag with a pasty piping tip. You may also cut the end of a zip top bag to make a free form pastry bag and tip as well. 6. 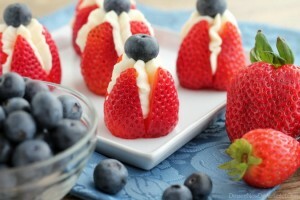 Top each filled strawberry with a blueberry. 7. Chill the strawberries for at least an hour before serving. Combine sugar four, gently stir in berries. Put in glass bowl and cover with plastic wrap. 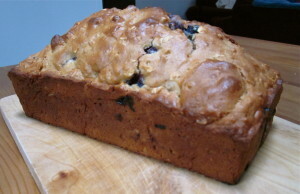 Toss the blueberries with ¼ cup of the flour. Fold in blueberries and remaining four until just mixed. Bake 50-60 minutes or until toothpick comes out clean. 1. 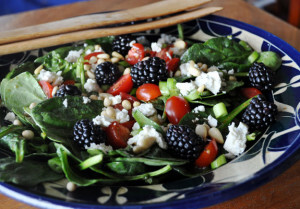 In large bowl, combine spinach, blackberries, tomatoes, onions and walnuts. Note: Boysenberries would also be delicious with this recipe. 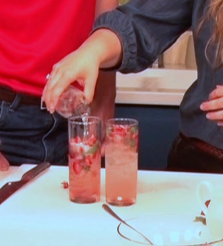 Add ice to a glass, and top with vodka, syrup and strawberry mixture. Finish with Vanilla or Lemon-Lime Soda & enjoy! Directions: In a small sauce pot add water and sugar and bring to boil. Add strawberries and basil, simmer for 10 minutes. Cool and strain. 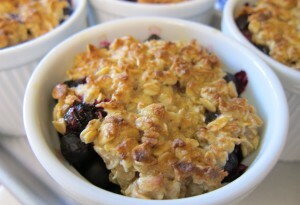 In a large bowl, toss blueberries with other berry ingredients, coating fully. Place four 8 oz or 10 oz ramekins onto a baking sheet, and distribute the blueberries and any remaining juice evenly into the ramekins. Using the same bowl, mix the topping ingredients together until fully incorporated. Top each ramekin with an even amount of the topping mixture, spreading to cover the berries. Bake the crisps at 350 degrees, for 30-35 minutes, until berries are bubbling and topping is light brown. Rest at least 10 minutes before serving.